Polonium was discovered by Marie and Pierre Curie in 1898 – the first new element discovered through the reduction of uranium ores, or pitchblende. It is relatively scarce in the Earth, as only 100 micrograms of polonium can be produced from one ton of uranium ore. The discovery of this element was predicated on the finding that after removing uranium and thorium from ore, the resulting material was actually more radioactive than the uranium or thorium itself. Because of its scarcity, polonium is now produced primarily through neutron bombardment of bismuth (209Bi) in a nuclear reactor. This bombardment creates 210Bi, and after decaying with a half-life of 5 days, and after decay, the resulting material is left as 210Po. Like many other radioactive elements, 210Po is used in radioisotope thermoelectric generators and had a hand in the Manhattan Project. Along with beryllium, polonium was one of the key ingredients in the detonator for the plutonium bomb, “Fat Man”. Additional applications of polonium include its use as a characteristic neutron source, and use in antistatic devices for industry. When rolling paper, wire or sheet metal, static electricity is often generated. A particle emitter such as polonium is often present in specifically designed brushes to minimize this static electricity, though industry has mostly replaced polonium with less harmful beta particle emitters. Special care must be taken with industrial processes when using polonium in this fashion. Additionally, polonium is utilized in applications with comparable necessities, for example: brushes to remove dust from photographic film and camera lenses. Because of its short half-life, these industrial tools need to be replaced on a regular basis. Traces of 210Po can often be found in cigarettes, agricultural phosphate fertilizers, seafood, and even in trace amounts in indoor air. Of the 15,000-22,000 estimated lung cancer deaths in the United States every year attributed to radon, polonium is present in (and presumed to be the cause of) the majority of these cases. Polonium, a metalloid, can readily create compounds with many other elements; however, most all polonium compounds are synthetically created with little applicability outside of the scientific community. Polonium has 33 isotopes observed in total, all of which are radioactive. The most stable isotope is 209Po with a half-life of 103 years, which then decays into lead through alpha decay. However, the most common isotopes of polonium are found widespread throughout Earth’s biosphere (in trace amounts), and is part of the naturally-occurring uranium decay chain. Polonium is a Block P, Group 16, Period 6 element. The number of electrons in each of polonium's shells is 2, 8, 18, 32, 18, 6 and its electron configuration is [Xe]6s24f145d106p4. The polonium atom has a radius of a measure of the size of its atoms, usually the mean or typical distance from the nucleus to the boundary of the surrounding cloud of electrons. Since the boundary is not a well-defined physical entity, there are various non-equivalent definitions of atomic radius. It is measured in picometres (pm)"> 168pm and its Van der Waals radius is 197pm. In its elemental form, CAS 7440-08-6, polonium has a silvery gray appearance. Polonium was first discovered by Madame Marie Curie and and Pierre Curie in 1898 who extracted it from pitchblende, a then known uranium source. Polonium is named after Madame Curie's birthplace of Poland. Polonium is produced during the decay of naturally occurring uranium-238. It has 33 isotopes, all of which are radioactive. Polonium 210 is a radioactive element with a half life of approximately 138.39 days. It occurs naturally and is widely distributed in small amounts in the earth's crust. 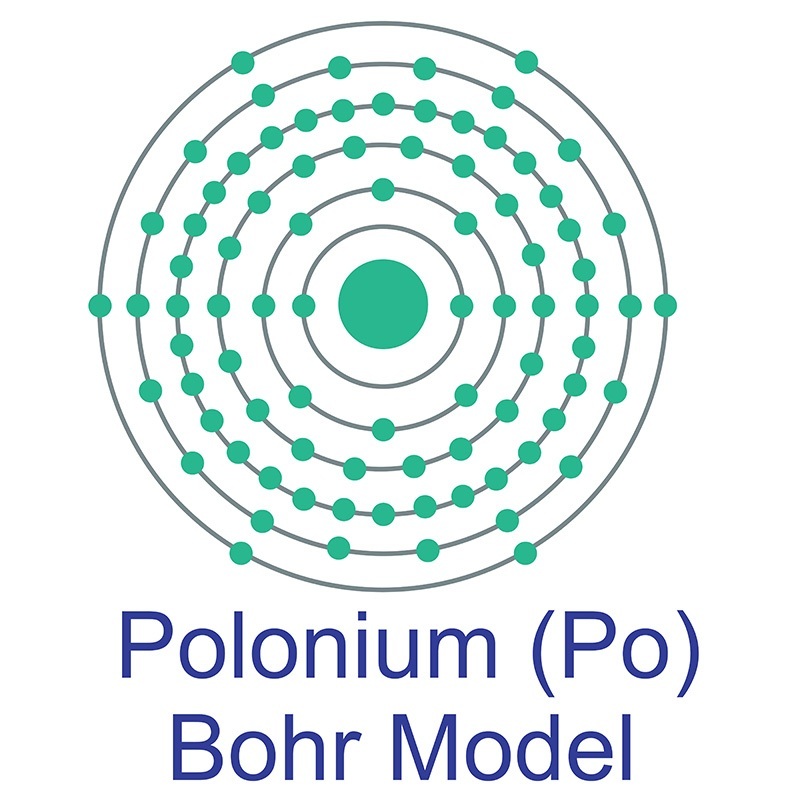 Polonium's most stable isotope is Polonium 209 with a half life of 102 years. Polonium is now commercially produced by neutron bombardment of bismuth 209 isotopes. Polonium-210 has been used as a heat source to power thermoelectric cells in satellites. Polonium-210 mixed or alloyed with beryllium is used in neutron sources. Polonium is also used to eliminate static electricity in machinery and to remove dust from camera lenses and film. Polonium is both toxic and radioactive. Polonium information, including properties, research, applications and other useful facts are discussed below. Scientific facts such as the atomic structure, ionization energy, abundance on earth, conductivity and thermal properties are also included. Polonium (Po) has 33 isotopes, all of which are radioactive.